A YA fantasy novel about a gay hero, Katjin, dealing with the ins and outs of a telepathic empire! Katjin, the only son of a traveling merchant, befriends a wanderer, Mikael. Mikael has not been branded by the Empire (as a 'path or non-'path) and so his presence puts Katjin's whole clan in danger. So Katjin, along with his cousin Soren, is sent away with Mikael - the cousins think they can solve the problem by a blood bonding ceremony which would make Mikael part of their clan. But danger is stalking them, and now there's no escaping the bonds they've forged. Can Katjin keep Mikael safe? 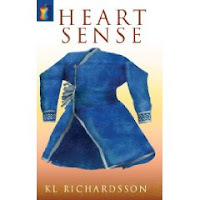 "Heart Sense" is K L Richardsson's debut novel! Add your review of "Heart Sense" in comments!